Popular Sagebrush model in Solera at Johnson Ranch. This home offers a beautiful backyard oasis that creates the perfect space for entertaining family or friends. Gorgeous upgrades throughout the home include extensive tile, French doors entering the den, a custom fireplace in the great room, custom stone accent walls in the kitchen and master suite. 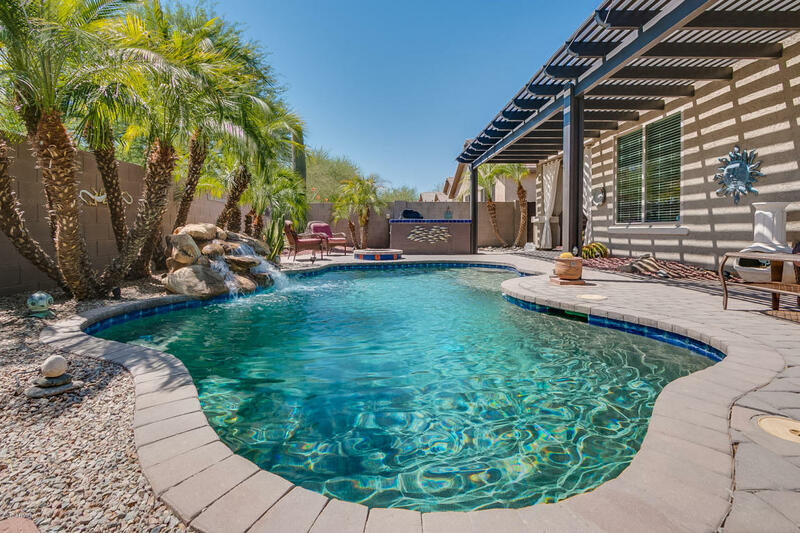 Step out back to the outdoor living area through the beautiful pergola that extends across the entire length of the home Enjoy the sparkling pool, waterfall and low-maintenance landscape. Enjoy the gas fire pit for chilly Arizona evenings. The home is in a gated enclave of Solera. Enjoy the community with recreation center, fitness center, heated pool/spa. Be sure to click on 3-D virtual tour to see more of this beautiful home!